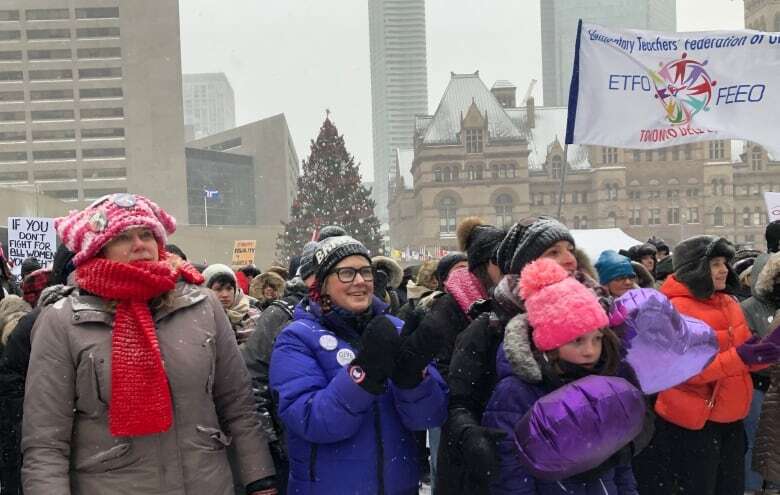 Hundreds of women rallied and marched in downtown Toronto on Saturday despite cold and snow to let the Ontario government know they won't stay silent against cuts that affect their rights. Organizers of the third annual Women's March in Toronto say the event was a chance to show the Doug Ford government that women will not return to the days when they enjoyed fewer rights than they do now. At midday, the women gathered in Nathan Phillips Square, where they listened to a handful of speakers, then they marched north on University Avenue to Queen's Park. On the Legislature grounds, the Ontario Federation of Labour made a "call to action," urging the women to continue fighting for their rights. Speakers at Nathan Phillips Square had been asked to shorten their speeches because of the cold. And when they spoke, they briefly addressed a wide range of issues, with each having her own focus. Coun. Kristyn Wong-Tam, who represents Ward 13 - Toronto Centre, said women were marching on Saturday to make sure their voices are heard on such issues of gender equality, poverty and violence against women. "There is a lot of anger around the austerity measures from Doug Ford, specifically how that can be harmful to women's lives and to their children and to their families," she said. "Considering the numbers that are out here, it's very encouraging." Before the speeches got underway on Saturday, drumming groups warmed up the crowd. 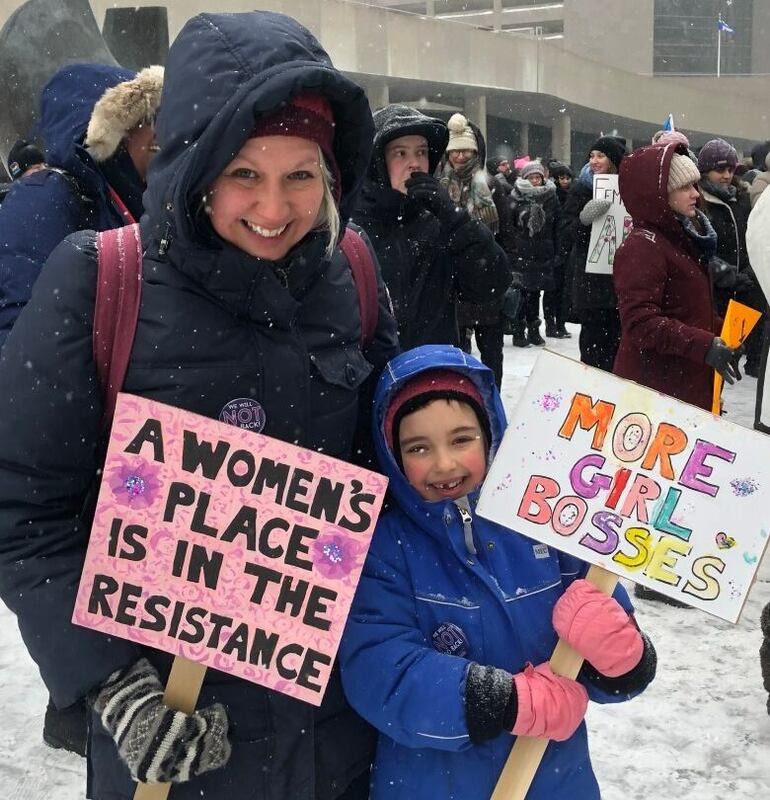 Ann Decter, a Toronto resident who took part in the rally and march and who serves as the director of community initiatives at the Canadian Women's Foundation, a public foundation for women and girls, said she was glad to see so many young women at the event. "It was cold but it was heartening," she said. "As we got onto University Avenue, we realized, there is way more people here than we thought." Bianca Spence, a member of the organizing committee of Women March On: Toronto and a co-chair of the event this year, said the march was an attempt to bring awareness to changes needed to make the city safer and more inclusive. "The theme of our march is: We will not go back," Spence said before the rally began on Saturday. "It's really speaking to a lot of the rollbacks and cutbacks that have been made recently through the provincial government and how those changes have affected some of the women and some of the most vulnerable people in our communities," she said. "Some of these cutbacks really are trying to move us backwards. This is a statement affirming that we are going to continue to move forward despite attempts to pull us back." Changes to the health and physical education curriculum made by the province to alter sexual education in Ontario schools. Replacement of the Ontario ministry of status of women, with women's issues shuffled to another portfolio. Cuts to planned increases to the Ontario disability support program. Scrapping of the minimum wage increase to $15 and paid sick days. Cancellation of the basic income pilot program. Closure of the Ontario Child Advocate's Office. 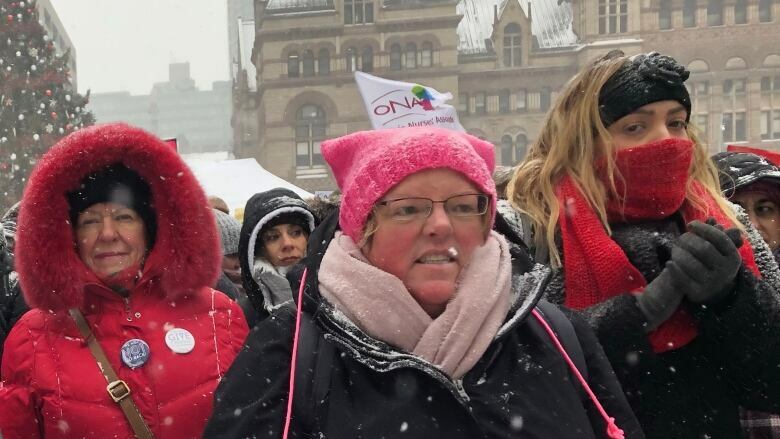 Women March On: Toronto, which has organized all three women's marches in Toronto since 2017, is not affiliated with Women's March Canada, a national organization connected to a larger group called Women's March Global. She said Women March On: Toronto is also not connected to the organization that marched in Washington, D.C. on Saturday. "We are completely local and independent. We're the people in your neighbourhood," Spence said. "We as a group just didn't want to be part of a big trademarked organization. I don't think you can trademark a movement. It doesn't belong to anybody. It belongs to everybody."